, : Look at the top two cards of your library, then put them back in any order. If that's not your kind of fun, I'd go for Rashmi. Her "randomness" is never bad as it's at least card advantage, and it can be abused with or without top. Crystal Ball is a card, so is Gilt-Leaf Seer. Scrying is no stranger to blue either, not with all it's index and brainstorm effects. Nope! That's covered! 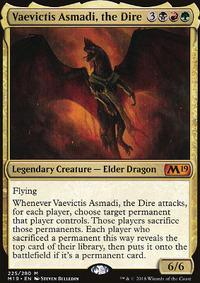 The problem with Rashmi is having enough mana and the ability to play at instant speed. 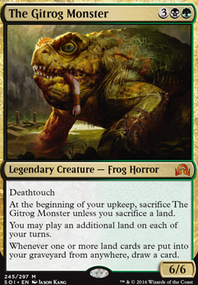 The immediate standout changes are to green's low-drop commons. Gone are the days of topdecking junk like Civic Wayfinder or Gilt-Leaf Seer. 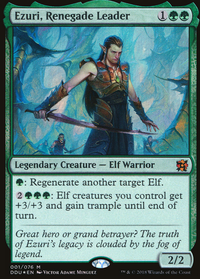 In place of crap cards are tried-and-true staples like 4xLlanowar Elves and 2x Wall of Roots. 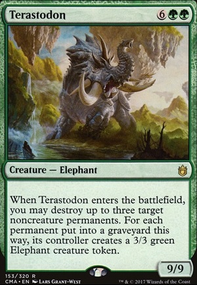 A total of ten mana dorks plus the acceleration from one Wood Elves, four dorks each to the 1-drop and 2-drop slot, dramatically transform this deck's image from that of a clumsy Wood Elemental to a a sleek Craterhoof Behemoth. 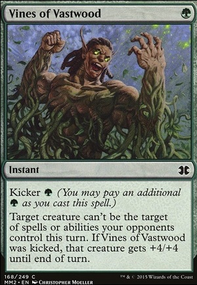 Very few mana acceleration was present in the original deck and I suspect that if it was playtested very much (spoiler: it probably wasn't) they would've balanced for green being uch, much slower than it now is, which will present a future balancing conundrum. Green's ramp payoff is mostly evenly distributed among the 5 to 8 drop slots. This is the opposite of a focused ramp deck, which will pay attention to specific drop slots with its specific dorks in order to get maximum consistency. I'm okay with this since this deck is meant to be played with beginners in a modest casual setting. I pretty much with everything Suns_Champion said. Vedalken Orrery is INSANE in creature based control decks! Some top deck manipulation I like are Ponder, Condescend, Crystal Ball, Preordain, Foresee and Telling Time. 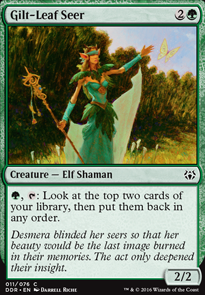 Soothsaying, Mirri's Guile, Sylvan Library and Gilt-Leaf Seer are repeatable options to look into. and for S's and G's Arachnogenesis is a fun little Fog like ability that can really change the flow of the game. Also why not run Halimar Depths? Gilt-Leaf Seer? Not great perhaps but it offers some kind of card selection. Cankerous Thirst, Artisan's Sorrow and Gilt-Leaf Seer look rather weak to me, i suggest cutting one of these.